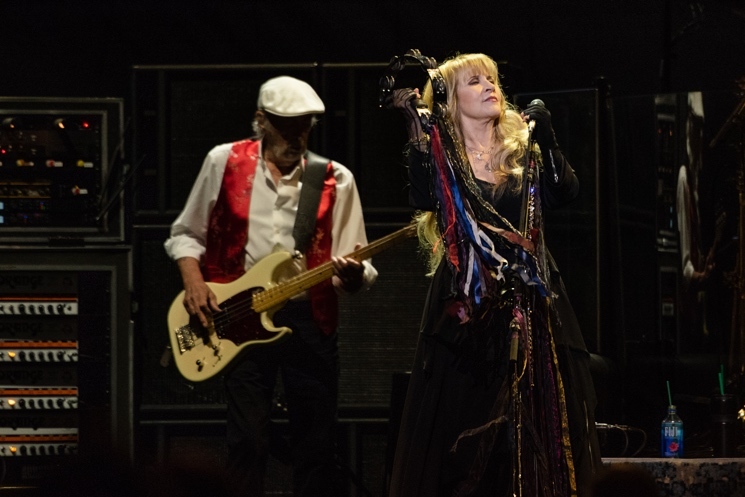 Fleetwood Mac recently extended their North American tour, but they've hit a bit of a speedbump before the first leg is even finished. The band have had to postpone their Edmonton and Calgary concerts due to illness. Rogers Place made the announcement just hours before the band's show in Edmonton was slated to happen on Saturday night (November 10). At the time, Fleetwood Mac also announced that tonight's (November 12) concert in Calgary would also have to be postponed. Both concerts have already been rescheduled. Fleetwood Mac will now play Edmonton on April 13 and Calgary on April 15, following the completion of the recently added shows. Tickets for the original dates will be honoured at the rescheduled dates. A "band member illness" was given as the reason for the last-minute postponement, though it has not been revealed which member of the group had fallen ill.
Due to a band member illness, the Fleetwood Mac shows scheduled for Saturday, Nov. 10 in #yeg as well as Monday, Nov. 12 in #yyc will be rescheduled. Fans didn't take too well to news that the Edmonton show had been postponed — or at least to how little notice they were given. See some of the heated responses below. As much as I love @fleetwoodmac they've always been completely self-absorbed. If one person's sick, I don't even care if it's Nicks, you go on. If people want a refund, they can have a refund. Pull it together people. Ridiculous 1 hour before the show, I just want my money back forget the next show. Drive 6 hours for this crap. See the group's remaining upcoming tour dates here.